One of my hobbies (!?) 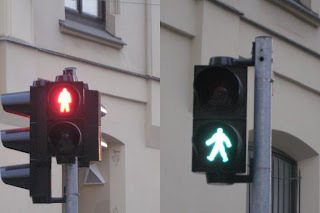 is to check out the pedestrian lights wherever I visit. Vienna's pedestrian light was just so artistic. I suppose there are lots of people riding bikes there, too. Btw, when I was in Japan this time, I noticed that the bikers follow the same lights with cars instead of the pedestrian lights!! I did some research and indeed in Japan bikers are supposed to follow the traffic lights for cars unless the pedestrian light has a sign next to it saying "Signals for Pedestirans and Bikers" speficically. Hmmm.